Are you getting the best pool cleaning service in Largo that you deserve? It’s a question that at Triangle we tend to ask all of clients beforehand. Most of the time, they’re only maintained enough to get them through whatever event or season they’re needed for; however, there are times when they may not be properly monitored, throwing off certain chemicals or balances that may be unknown to the owner. These are some of the issues that we focus on when ensuring that residential pools in Pinellas are in ideal condition all year around. To put it another way, your pool is an extension of your property. Just like how green and rich your lawn is, one would hope your water oasis has proper care; no matter what time of the season it is. If left unchecked, it could become a victim of unwanted bacteria and other unpleasing aspects. Discoloration and foreign objects can start to form, leaving the area an unpleasant sight. This can give your neighbors and onlookers a negative perception of your home. With the benefit of having a pool cleaning service in Largo, let Triangle Service prevent these avoidable traits from even happening. In reality, pools cannot clean themselves. There are certain levels of pH that need to be in balance in for it to be safe to swim in. One cannot assume after one round of balancing, that it’s okay to to enter the pool. Even if your pool is far away from other contaminants. Your body, as well as other unseen elements, can introduce new particles that can still throw off its chemical balance. 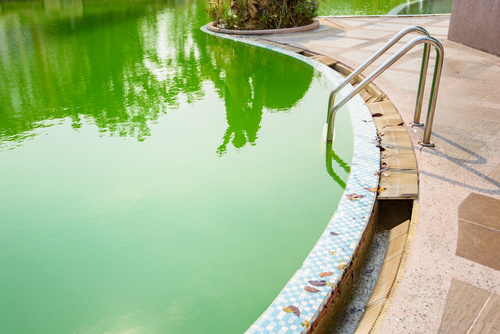 It would be imperative to hire a professional pool cleaning service in Largo, Clearwater, Seminole, and St Pete, Florida to help you with these situations, being mindful that anything could happen to its health if left unnoticed and untreated. Triangle Service can handle any cleaning task required by any sized pool. With over 50 years of experience, our associates know how to tackle even the grimiest situations. As a licensed and insured business, our job is to make sure that your water oasis is healthy and appealing to you and your family standards, as we have access to the proper amount of tools for the job. Using only the most up to date and state of the art technology and techniques, we infuse our knowledge of pool cleaning services in Largo with passed down methodologies from our own and other service technicians in the trade. We will ensure that your oasis stays just like that-an area for pure relaxation. Additionally, we offer our pool services beyond what our first appointment entitles. We don’t present ourselves to be “occasionally monitoring” your pool. By taking one step further, we’ll make it our duty to schedule checkups and added maintenance based around your schedule. Whether it’s scrubbing the bottom lining, inspecting chemical levels, or removing debris, we’re your go-to pool cleaning service in Largo. With all things considered, one cannot afford to leave theirs untended to, especially in moments where guests are over or when making a lasting impression within your neighborhood. This part of any yard is should be both hygienic and clean to ensure the enjoyable Floridian pastime of relaxing is at an optimal level. It’s never too late to give us a call to let our qualified technicians do what they do best. No matter the time of month or season, we will always be there to maintain your pool. Call us at (727) 531-0473 to see how our pool cleaning service in Largo, Seminole, Clearwater, St Pete, and Palm Harbor, Florida as well as the other surrounding areas of Pinellas county, can help your household bask in the most ideal area.